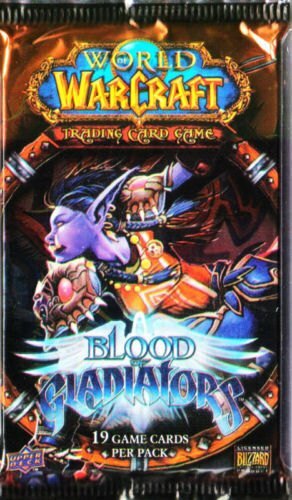 Blood of Gladiators introduces new crafting cards, characters from the World of Warcraft comics (with art done by Jim Lee! ), and three new racial keywords card types. The set consists of 208 cards (10 Epic, 60 Rare, 40 Uncommon, 80 Common, and 18 Heroes). Three new loot cards (Sandpaper Tiger, Epic Purple Shirt and Foam Sword Rack) are randomly inserted as well.